Nineteen years ago tonight, I was worried that my wedding outfit would get wrinkled. I was worried that I still had some details for our brief honeymoon to work out. I was worried that in three weeks, we’d be moving 1,150 miles away from home. To a place I’d only spent two days in before. To a place where I knew no one and had no job. Nineteen years ago tonight, I was excited thinking about the beautiful setting for our wedding. I was excited that we’d have a natural chuppah, as a fabulous tree overhung the patio at my aunt’s house. I was excited that my childhood rabbi would officiate. He was quite old. It was his last wedding, and honestly, I’m not at all sure that he said all the things he was supposed to say. I was crazy about him though. He’d married my parents, bar mitzvah’d my brother, traveled with my grandparents. I’ll always remember him, and all his stories, warmly. Nineteen years ago, I was stressed out that the caterer for our tiny ceremony and dinner (19 attended) would forget something. That the tables wouldn’t look right. That the cognac and the champagne that we so lovingly chose wouldn’t live up to snuff. But not for one second did I worry if I made the right decision. Everything in me knew that Andrew and I would make a happy life together. Nineteen years later, it’s nice to be right. < Knowing where to go. Ohhhh, this made me cry a little. Happy anniversary to you both! I’ll drink to that! Happy Anniversary! oh my, I did get a little teary eyed there. Happy Anniversary you two!! That made me cry a lot (sorry, Shel, I am so competitive when it comes to emotions). Loved this. And love you both. Happy Anniversary to a great couple. 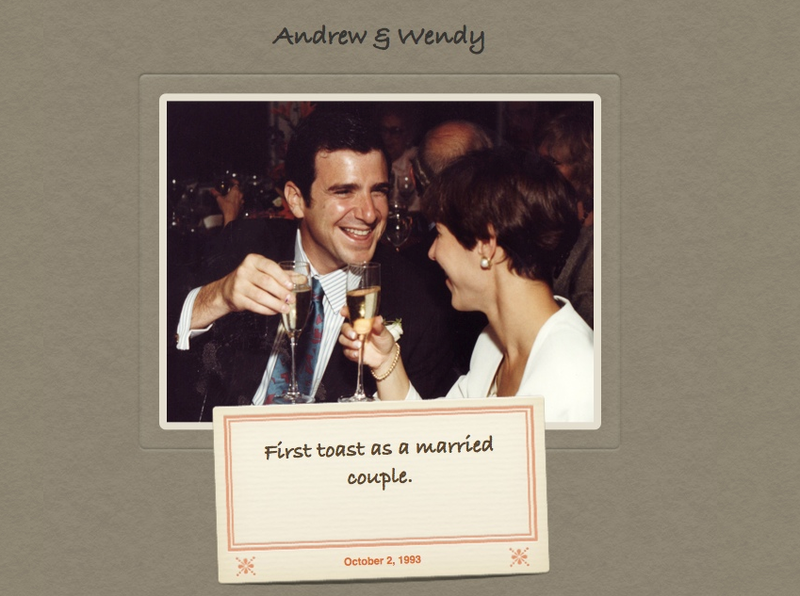 Happy anniversary Wendy and Andrew! I loved the fact that you chose to be married at my house, and that it was a wedding to remember!